Flipkart is currently running its Grand Gadget Sale, where a host of gadgets are available at a discount. Along with the Grand Gadget Sale, Flipkart also has a Samsung-specific sale between June 13 and June 15. Most Samsung devices from smartphones to wearables and home appliances are covered under the new sale. Samsung Galaxy C9 Pro: Announced earlier this year, Samsung Galaxy C9 Pro comes with a price slash of Rs 5,000, meaning the 64GB variant is available for Rs 31,900. The smartphone also has an exchange offer giving buyers up to Rs 15,000 off. There is also a no cost EMI scheme applicable. Samsung Galaxy On Nxt (64GB): The Samsung Galaxy On Nxt comes with a 16 percent discount on MRP, and is priced at Rs 14,900. Additionally, there is also an exchange offer up to Rs 15,000 off along with no cost EMI scheme and a 10 percent cashback offer with Citi Credit and Debit Cards. Samsung Galaxy J7 Prime: Samsung Galaxy J7 Prime is available for Rs 16,900 after a six percent discount offer. Apart from the price slash, the smartphone has an exchange offer of up to Rs 15,000 and EMIs starting at Rs 820 per month. Samsung Galaxy S8 and Galaxy S8+: Samsung Galaxy S8 and Galaxy S8+ do not come with price drops, but there’s an ICICI Bank cashback offer of Rs 2,500 on both the smartphones. Additionally, the smartphones also come with no cost EMI, exchange offer up to Rs 15,000 and double data offer for Reliance Jio users. Samsung Galaxy On8: With a price drop of seven percent, Samsung Galaxy On8 is now available for Rs 12,490. The smartphone also comes with an exchange offer of Rs 11,500 and a 10 percent cashback for Citi Credit and Debit card users. Samsung Galaxy On5: In the budget segment, Samsung has the best offer on the Samsung Galaxy On5. The smartphone’s price comes down to Rs 6,690 after a 25 percent off on the actual price. Additionally, Flipkart is also offering a Rs 6,000 discount on exchanging your old smartphone for the Galaxy On5. 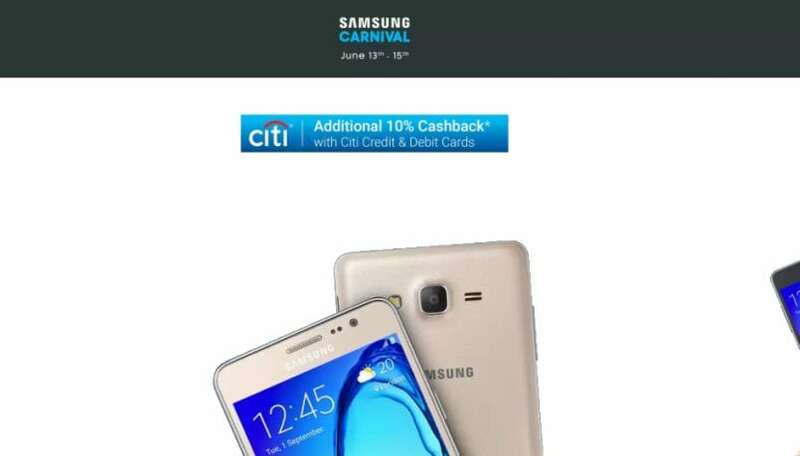 The additional 10 percent CitiBank cashback is valid on this smartphone too. Apart from the above mentioned smartphones, Samsung and Flipkart have an offer on other smartphones like the Galaxy J5, Galaxy J6, Galaxy J3 Pro, Galaxy On7, Samsung Z2, and Samsung Z4. The discounts start as low as Rs 140, and go as high as Rs 5,000 (apart from exchange offers). Samsung Gear S2 Classic and Gear S2 Silver smartwatch: Samsung Gear S2 Classic smartwatch comes with a 48 percent discount, and is priced at Rs 17,900. Samsung Gear S2 Silver watch is available for Rs 14,900. Samsung Gear VR: Samsung Gear VR has a massive 51 percent discount, and it is available for Rs 3,999. Additionally, there is an extra five percent discount for Axis Bank Buzz Credit Card users. Samsung Gear IconX Black Smart Headphones: The Samsung Gear IconX Black Smart Headphones are priced at Rs 9,990 with 25 percent off, and additional five percent discount for Axis Bank Buzz Credit Card users. Many other Samsung tablets, printers and monitors, headphones, washing machines, air conditioners and refrigerators are also up for sale.